These can burn wood, coal, and a whole range of other combustibles. They have BackBoilers – literally a boiler attached to the back of the stove – to heat water for radiators / hot water. Stoves Online – Backboilers – Sell a range of stoves, and have great examples of different systems. Ideal Boilers – another description, not woodburner-specific. For even greater resilience we’d have multiple options for hot water and heating. Pairing a Sola Hot Water system with a woodburning stove makes a lot of sense – Solar works best in the summer when you don’t want the stove heating up the house, and in Winter the heat of the stove is a welcome side-effect. Solar Sense – supply solar hot water systems and tanks for self-install, or installed. These have changed a lot since I was a kid, when we had a big coppery tank in the Airing Cupboard with a thin, patchy red jacket strapped onto it for insulation! Now there’s a whole range available with cast-over insulation, and – essential for our resilient system – multiple inputs. So you can plumb several heat sources into the one tank: Solar, Gas, Electric, or Solid Fuel. A Thermal Store (or Heat Accumulator) is a good way of making the most of your solar and wood-fired hot water. Think of it as a huge hot water tank that can take all the heat your stove can throw at it while going at its most efficient, fast, burn. Boiler Stoves – Heat Accumulators – great description of thermal stores. Mcdonald Engineers – Scottish maker of hot-water cylinders and thermal stores. Imagination Solar – Hot water Cylinders for solar / multi-fuel systems. Thermomax – US site, but very comprehensive range of products. Albion Water Heaters – UK supplier of Solar / multi-fuel systems. Heatweb Thermal Stores– A great explanation of heatstores and how to integrate them into your system. Short, or poorly-insulated flues seem to cause many problems for woodfired stoves – causing them to let smoke into the room among others. Flue Systems – supply everything your flue may need, including insulated twin-wall flues, chimney fans and cowls. Well that’s enough background to get started – I’ll add more when I’ve worked out what we’re going to do! I have a dream that we can be free from shop-bought tomato purees, passata and pasta sauces. We typically eat one jar of shop-bought sauce each fortnight, plus extra tomato puree into sauces, cassoulets etc. So my target for sauce-self-sufficiency is probably about 26 500ml jars, and then maybe another dozen 100ml jars – so about 15 litres of sauce would be a good target. Apparently 5kg of tomatoes will get you about 4 litres of sauce, so we need to be looking at around 20kg of tomatoes – no small feat, but certainly not enough to trigger a full-on “Doing the Tomatoes” or “National Wog Day“. To do this properly, you really need a Passata Machine or a Mouli – these will give you the puree without the skins and seeds, and you’ll need some clean, sterilized jars to contain the delicious results. store for up to year. Turn it into a complete pasta sauce. Gently fry onions and garlic, add passata and reduce over a low heat until you get to a more traditional pasta sauce consistency. Add some herbs (basil) to the jars before bottling for extra flavour – this is also a good way to “preserve” your garlic and herbs! Make concentrated tomato paste / puree. Great for flavouring a range of dishes, this can either be made from the plain passata, or from the garlic, onion and herb-flavoured sauce. Essentially you just keep reducing the sauce until you have a thick paste – there is a great description of how to do it here. For stronger flavours: Oven-roast the tomatoes for about an hour at a low heat instead of boiling them – gives a richer, thicker sauce. This whole post was inspired by an off-hand remark by Contadino about his hand-cranked passata machine – go and have a look at the wonderful description and photos on his website – can you believe how many tomatoes he’s grown! Another wonderful inspiration is the description of “Doing the Tomatoes” on Cream Puffs in Venice – showing the cultural side. For really detailed descriptions on making passata have a look at Mas du Diable who also has a great page on other ways to preserve tomatoes – I love a good chutney so I need to spend more time looking at that! And for more discussion on hand-powered passata machines have a look over at my Gentle Descent blog. Just been reading some great descriptions of how to make Passata, and Pasta Sauces. I’ve long thought that this could be a good way to make the most of our Aquaponic bounty through the long winter months – delicious home-grown-and-made pasta sauces, flavoured with our aquaponic-grown herbs. I think the Mouli that is already on my shopping list would be good at turning our tomatoes into passata while removing all the skins and seeds, but there are also specific Passata Machines – they look sort of like a mincer. The only ones I’ve been able to find in the UK are these red plastic models, sold by Seeds of Italy for £27.50, or Ascott for £25. Apparently you can process over 50kg of tomatoes in them in an hour! They both also sell the preserving jars we’ll need – Ascott seem to have the best range of jars at the best prices – 12 500ml jars for £17. Not sure whether this makes it onto my list of must-have post-peak-oil kitchen gadgets, or whether I’ll stick with a nice strong metal mouli. Maybe if I can find a more traditional metal Passata machine like the one Contadino uses then I’d be converted . . . I’ll have to look next time I’m on the continent! I still haven’t managed to find a manufacturer of micro-flush composting toilets in the UK, but at least I have now found a supplier: The Envirolet Low Water Remote System (pictured) is shipped from a UK warehouse. It’s paired with the Sealand 510 Pedestal which seems to be standard for micro-flush systems, and the price includes the pedestal, which makes the package price a little more reasonable. The design looks like it has a lot less moving parts that the SunMar, which might make it a more resilient choice. They even have a video taking you through all their systems – here. The Composting Toilets Group – great for asking strange questions on every system, from bucket-and-sawdust to full domestic electric systems. Technical drawings of the Sealand 510 pedestal from a UK supplier. A great holiday spot to test out the Sealand toilets – Saba Eco Lodge. In our post-peak-oil world, as energy gets more expensive and fossil-fuel-based fertilisers become rarer, the sewage system is one area we can look at making a big difference. Sounds distasteful I know, and not some thing usually discussed around the world’s dinner tables! Everybody has a memory of using a non-plumbed toilet somewhere – a cabin in the woods, national park or dodgy campsite, and so we flee back to our ceramic thrones, happily filling them with water treated to drinking-water standards and transported many miles for a single flush . . . and then transported many miles for treatment and disposal. Surely there must be better ways as we look to reduce the waste that our waste creates? There are many half-measures to make sure you’re using: get a dual-flush loo, or put a brick in the cistern of your old Victorian model to reduce the water it uses, connect your toilets up to use greywater or rainwater, so you don’t waste mains water at all. If you’re taking it seriously though, you need to look at the new ranges of compost toilets that are available. These use no, or little, water. They do not need to be connected to the sewer system. They can be made of a classic ceramic rather than camping-style fibreglass. And – surprise surprise – do not smell. The other reasons for considering these are those put forward by the panic-merchants over at Life After The Oil Crash and in many post-disaster scenarios: the mains water may stop flowing and the sewage system may stop working. Just imagine what life in your house would be like after a week of no sewage facilities – not a pretty sight! In case you think these are overly farfetched, consider our situation here in Brisbane. Until huge storms hit earlier this year our dam levels were down to the low teens – around 14% of their capacity. We were facing the prospect of tankers drving water in from other areas, and a huge number of water-conservation measures were in place. One of these was aimed at reducing water use in toilets – “if it’s yellow, let it mellow, if it’s not, flush the lot!” This was remarkably successful, but with unintended consequences. I overheard a conversation at the height of the drought where someone from Brisbane Water was saying that they were starting to have real problems with the sewage system, as the “ratio of liquids to solids” had changed so much that things were no longer moving smoothly through the pipes! An interesting situation for a city of 1.5 million! 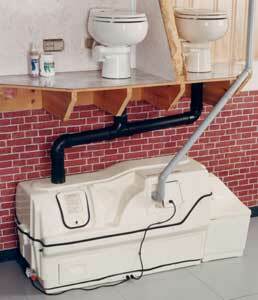 Anyway, whatever your reasons, if you do want to retrofit a compost toilet, what are the best options? The “classic” style seems to still seem rather rustic, and I’ve been looking for something that I can persuade my other half is as similar to our current WC as possible. What I’ve found is a “one-pint” system, which uses a tiny amount of water to flush, and then goes into a composting system which can be situated outside the house, and emptied just once a year. What I’m looking at is the Sealand 510 Plus, which is ceramic and can take a standard size toilet seat, and I’ll connect this to a Centrex 3000 AC/DC or NE (pictured). Could be an ideal solution – not too intimidating for the user, easy to position or retrofit, and not too expensive. Now all I have to do is find a local supplier!